Photoresistor (5 k to 0.5 k ohm, dark and lit). Resistors: 30, 1k, 22k, 51k ohm. Capacitors: 0.01 uF and 0.02 uF. With the parts they were given the task of building a laser tripwire alarm. 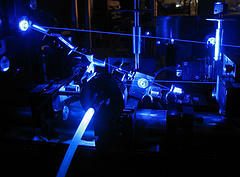 The system had to sound an alarm whenever the path of the a laser beam is interrupted. With more parts, there would be many possible solutions to this problem, so I tried to limit the scope of the test by restricting the components to a bare minimum. I made it work using only these components and relying on information we learned in class. The test had a good mix of challenges for the students: they had to design several circuit blocks and interface them, use a datasheet to learn and use a new device (555 timer), and debug under time pressure. The solution they came up with was very similar to my own: use the photoresistor in a voltage divider to drive the transistor base high or low. 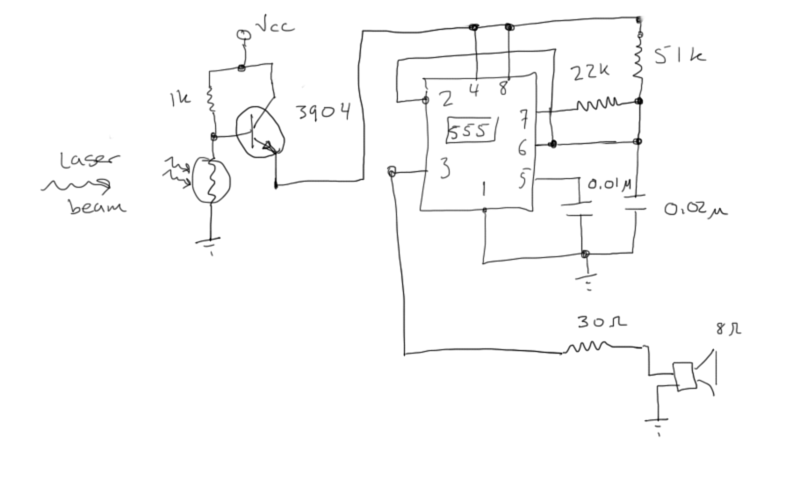 The transistor then gates power to the 555 timer which is configured as a 50% duty-cycle square-wave generator (schematic available in the datasheet). The 555 timer can drive a 50 ohm load, so putting a small resistor in series with the headphone worked like a charm. This is probably not the most robust or fault-tolerant design, but it works and it takes very few parts. It was so much fun to watch them solve this problem that I think I’ll run group questions on the midterms next time around. The best part for me was watching one student (who has been at the tail of the grade curve all semester) catch and fix two of the major problems they ran into with thier circuit. His struggles during the semester really paid off since he was now one of the better debuggers in the group. If you have had good or bad experiences with group tests, I’d love to hear about them. I may have gotten lucky with my first attempt, but it seemed like a great way to test everyone without watching them fail for making silly mistakes. This entry was posted in college, experiments, physics, teaching and tagged electronics, exam, optics, teaching. Bookmark the permalink. Do you have a written copy of the circuit they/you used? I’m trying to build one. I’ve got no idea what I’m doing… I’ve been trying to teach myself. If you could give a diagram to work off of, I’d be very, very greatful. The schematic for the laser tripwire alarm has been posted. Thanks for reading. What an awesome article. I’m still trying to learn this stuff and I’m moving along but I wish I’d have been offered a class on it in my school days instead of some of the useless crap I ended up taking. Keep it up! We were using TLC555 chips so it could be anything between 3 and 15V or so. I think they set it at about 5V… but it’s been two years so that memory may be faded. The crucial part is to get the voltage divider output to trip the transistor, this depends on your photoresistor and Vcc. Nothing here is hurt by going between 2V and 15V so if you can try a range, you should be able to find something that works. If you’re working with a fixed voltage, then you may want a potentiometer in place of the 1k resistor at the front end. That would let you change the setpoint.